Excess water from showers, baths, sinks, and washing machines is known as greywater. This water has not been in contact with human waste but is often not suitable for drinking. However, water from the sink in a kitchen or dishwasher contains organic materials and should definitely be avoided. Even with these restrictions in mind, there are many ways a typical homeowners can reuse greywater. Recycling water is a great way to have more water available to water flowers and plants during droughts or short periods of no rain. If you like to water your yard or want to wash your car, then greywater will be a great solution. However, the best reason to reuse greywater is to save money. A homeowner who lives in a city will typically pay water and sewer rates. This means any water being used to wash a vehicle or water the yard will cost money. If you reuse greywater, then you will not be paying for water use and sewer costs. The most important thing to know is how to collect greywater. Greywater can be collected in several ways and will allow you to reuse greywater for any purpose. One way that this can be done is by collecting water in a bucket when you are waiting for a shower to get hot. 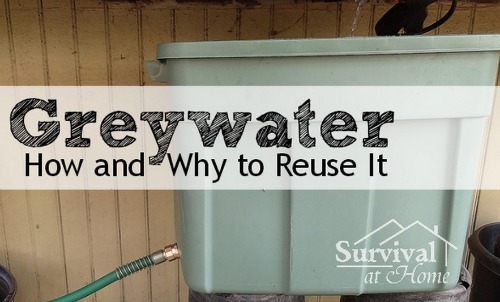 There are also a variety of other ways to reuse the greywater collected in your home. Another way to reuse greywater is to wash dishes. You can heat water on your stove and wash dishes. The left over water can then be added to a compost pile or used to water your garden. This means you can reuse greywater to complete various tasks. If you are looking for a good way to save money, then reusing water is a great option. Collecting water will reduce the water use in your home and can help to lower monthly utility bills.